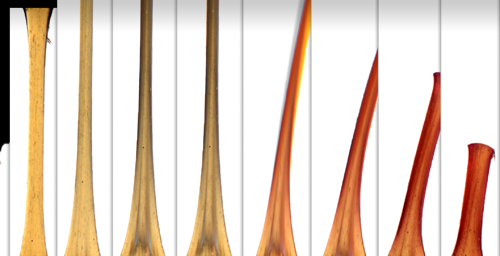 Progressive images of a mechanophore linked elastomer during tensile loading. After the polymer reaches a critical strain, a force-induced red color results from selective covalent bond cleavage in the mechanophore just prior to failure. The polymers contain mechanically active molecules called mechanophores. When pushed or pulled with a certain force, specific chemical reactions are triggered in the mechanophores. "This offers a new way to build function directly into synthetic materials," said Nancy Sottos, a Willett Professor of materials science and engineering at the U. of I. "And it opens the door to creating mechanophores that can perform different responsive functions, including self-sensing and self-reinforcing, when stressed." In previous work, Sottos and collaborators showed they could use mechanical force to induce a reaction in mechanophore-linked polymers that were in solution. Now, as reported in the May 7 issue of the journal Nature, the researchers show they can perform a similar feat in a solid polymer. Mechanically induced chemical activation (also known as mechanochemical transduction) enables an extraordinary range of physiological processes, including the senses of touch, hearing and balance, as well as growth and remodeling of tissue and bone. Analogous to the responsive behavior of biological systems, the channeling of mechanical energy to selectively trigger a reaction that alters or enhances a material's properties is being harnessed by the U. of I. researchers. In critical material systems, such as polymers used in aircraft components, self-sensing and self-reinforcing capabilities could be used to report damage and warn of potential component failure, slow the spread of damage to extend a material's lifetime, or even repair damage in early stages to avoid catastrophic failure. "By coupling mechanical energy directly to structural response, the desired functionality could be precisely linked to the triggering stimulus," said Sottos, who also is affiliated with the university's Beckman Institute. In their work, the researchers used molecules called spiropyrans, a promising class of molecular probes that serve as color-generating mechanophores, capable of vivid color changes when they undergo mechanochemical change. Normally colorless, the spiropyran used in the experiments turns red or purple when exposed to certain levels of mechanical stress. "Mechanical stress induces a ring-opening reaction of the spiropyran that changes the color of the material," said Douglas Davis, a graduate research assistant and the paper's lead author. "The reaction is reversible, so we can repeat the opening and closing of the mechanophore." "Spiropyrans can serve as molecular probes to aid in understanding the effects of stress and accumulated damage in polymeric materials, thereby providing an opportunity for assessment, modification and improvement prior to failure," Davis said. To demonstrate the mechanochemical response, the researchers prepared two different mechanophore-linked polymers and subjected them to different levels of mechanical stress. In one polymer, an elastomer, the material was stretched until it broke in two. A vivid color change in the polymer occurred just before it snapped. The second polymer was formed into rigid beads several hundred microns in diameter. When the beads were squeezed, they changed from colorless to purple. The color change that took place within both polymers could serve as a good indicator of how much stress a mechanical part or structural component made of the material had undergone. "We've moved very seamlessly from chemistry to materials, and from materials we are now moving into engineering applications," Sottos said. "With a deeper understanding of mechanophore design rules and efficient chemical response pathways, we envision new classes of dynamically responsive polymers that locally remodel, reorganize or even regenerate via mechanical regulation." In addition to Sottos and Davis, the paper's co-authors include materials science and engineering professor Paul Braun, chemistry professors Todd Martinez and Jeffrey Moore, and aerospace engineering professor Scott White, as well as members of their research groups. The work was funded by the U.S. Army Research Office MURI program.